The terms and conditions stated herein (collectively, the “Agreement”) constitute a legal agreement between you and Wholesale Jet Members Inc., a New York corporation dba (“Wholesale Jet Club”). In order to use the Service (defined below) and the associated Application (defined below) you must agree to the terms and conditions that are set out below. By using or receiving any services supplied to you by Wholesale Jet Club (collectively, the “Service”), web service supplied by the Wholesale Jet Club which purpose is to enable you to use the Service you hereby expressly acknowledge and agree to be bound by the terms and conditions of the Agreement, and any future amendments and additions to this Agreement as published from time to time at terms or through the Service. Wholesale Jet Club reserves the right to modify the terms and conditions of this Agreement or its policies relating to the Service or Application at any time, effective upon posting of an updated version of this Agreement on the Service or Application. You are responsible for regularly reviewing this Agreement. Continued use of the Service after any such changes shall constitute your consent to such changes. Grandfathered membership fee rates are subject to periodic inflation adjustments and do not include access to new services or benefits that may be offered after the initial date of purchase of membership. Wholesale Jet Club offers access to a number of programs including single-entity charters. For single-entity charters, Wholesale Jet Club shall act solely and exclusively as your agent in arranging the flight. All charter flights are operated by U.S. 14 CFR Part 135 air carriers. Operators, and not Wholesale Jet Club or the aircraft owner, are responsible for ensuring the safety of a flight and providing the charter services, including the flight crew, aircraft operations. Operators have authority from both the FAA and DOT to operate. Wholesale Jet Club is NOT a registered U.S. 14 CFR Part 135 operator, nor does it provide air carrier services. Wholesale Jet Club offers the method by which to obtain the services of the Operators, but in no way does it have any responsibility or liability for any charter services provided by third parties. By using the Services and booking a flight, you authorize Wholesale Jet Club to enter into a charter contract with the Operator as your agent. You will be responsible for arranging flights with an Assigned Aviation Specialist, Wholesale Jet Club’s website(s) or other method acceptable to Wholesale Jet Club. Acceptable methods may include email, text message or telephone with a Wholesale Jet Club Aviation Specialist. For single entity charters, on your behalf and as your agent, Wholesale Jet Club will confirm aircraft availability with the Operator, execute necessary documents to reserve the aircraft, and process payment. It is your sole responsibility to carefully review and verify all travel details reflected in the confirmation when completing the reservation. Upon your review and acceptance of the invoice or booking confirmation, any trip cancellations or modifications will be subject to applicable cancellation policies. You shall be responsible for opening an account, providing payment authorizations for travel services and paying for Services according to the terms and conditions of this Agreement and any additional terms and conditions presented to you at the time of booking and incorporated hereto by this reference. You agree to open an account with Wholesale Jet Club and to provide all requested information, including a credit card to be kept on file and used for pre-authorization/reservation and payment/capture for Services requested and authorized by you. When reserving an aircraft with a credit card an authorization/reservation will be processed for the amount reflected on the Invoice Quote (as defined below) plus a 5% administrative fee. Prior to reserving an aircraft, Wholesale Jet Club will provide you with an invoice quote that will outline the preliminary cost of the requested flight (“Invoice Quote”). Please note that the Invoice Quote might not include Additional Expenses as fully described below. Once you confirm and approve the Invoice Quote, you shall be responsible for authorizing payment for the Invoice Quote from your account using the available methods offered by Wholesale Jet Club. Additional expenses may be incurred for the following: in-flight telecommunications and internet usage, excess luggage fees, fees for pet transportation, cleaning services for pet transportation or cleaning required due to the excess wear and tear of the aircraft caused by your or your invitees, catering orders, ground transportation and other services whether or not itemized in the confirmation documentation will be billed when incurred on your behalf. There may be a fuel surcharge or winter segment fee in order to provide for aircraft de-icing or hangaring, which may be itemized separately and appear as an added charge upon booking or at a later time if services are added or consumed after booking. These charges may originate from the Operator providing air transportation services or a third party provider. Unless you inform and instruct us otherwise, charges related to such additional expenses will be charged to the credit card on file. Wholesale Jet Club will transmit a Final Invoice to you detailing Member’s incurred charges after the flight or as soon thereafter as charges for additional service and extraordinary items are provided by the Operator to Wholesale Jet Club. In the event that any amount due from you to Wholesale Jet Club hereunder remains unpaid for more than five (5) days beyond the date such amount was due to be paid, such outstanding amount shall be subject to interest at the lesser of 1.5% per month or the maximum amount of interest permitted by law. In the event that any form of payment provided by you to Wholesale Jet Club is rejected and Wholesale Jet Club incurs any fees as a result of such rejection (e.g., insufficient funds), you shall be responsible to reimburse Wholesale Jet Club promptly for all such fees. In accordance with the United States Transportation Security Administration (“TSA”) regulations and additional government regulations you and your authorized guests are required to comply with all TSA regulations, and will be required to present valid identification prior to departure for all flights. For international flights, you and all additional passengers must have a valid passport in his or her possession as well as any required visas or entry documentation. Operator has the right to refuse boarding to any person without the required documentation or as a result of non-compliance with TSA or other government regulations without recourse or further obligation on behalf of Operator or Wholesale Jet Club. Wholesale Jet Club will require you to provide detailed and accurate passenger information regarding all persons traveling pursuant to arrangements made by you, after or during the booking process. Such information has to be furnished to Wholesale Jet Club no later than twenty four (24) hours prior to departure. You agree to timely provide to Wholesale Jet Club all required information, and understands that failure to provide the information, providing inaccurate or incomplete information in a timely manner may result in delaying a flight, the Operator or pilots electing to deny boarding, and ultimately in you missing the flight, which will be considered a cancellation without notice and will incur a cancellation penalty. You agree that you are obligated to fly according to the Flight Itinerary provided by Wholesale Jet Club which stipulates the departure time based on and in consideration of the preferred departure time indicated by you at the time of booking. YOU MUST BE AT THE AIRCRAFT PREPARED TO TRAVEL AT THE DEPARTURE TIME INDICATED ON THE FLIGHT ITINERARY. FOR SINGLE ENTITY CHARTERS, IF YOU ARE NOT AT THE AIRCRAFT 30 MINUTES AFTER THE SCHEDULED DEPARTURE TIME READY TO FLY, YOU WILL HAVE MISSED THE FLIGHT. For single entity charters, Pilots may wait up to 1 hour after the indicated departure time as a grace period, but are under no obligation to do so. Should you miss a flight, you will be charged for the missed flight and payment will be rendered according to the terms and conditions of the confirmation and this Agreement, failing which, the pre-authorized credit card will be charged as provided for herein. Wholesale Jet can arrange an alternate aircraft for additional fees. Wholesale Jet Club shall not be liable for any delay or failure to perform in connection with any flight, Service or in the performance of any obligation hereunder or for any such delay, unavailability, inaccessibility or failure is due to or in any manner caused by acts of God, rebellion, riots, hijacking, insurrection, civil commotion, strikes or labor disputes, fires, floods, laws, regulations, acts, demands or and orders of any government or agency, seizure of the aircraft under legal process, adverse weather conditions, inability to obtain fuel, aircraft damage or loss, lack of essential parts or supplies, mechanical problems, illness or incapacitation of crew members, denial of operating or landing approvals, clearances or permits by governmental authority, denial of service attack, any other attack on the systems of Wholesale Jet Club, scheduled maintenance of Application or any other cause which is beyond the control of Wholesale Jet Club. Wholesale Jet Club is hereby released from any claim or demand for any direct or consequential damages arising out of failure to perform as a result of a force majeure event whether or not herein enumerated or other event referenced above. In no event shall you pursue Wholesale Jet Club for any amount in excess of actual membership fees and Wholesale Jet Club liability shall be strictly limited to an amount equivalent to the membership fee actually paid by you. If your conduct or the conduct of your guest endangers the aircraft or any passenger or property while on board, or you obstruct or hinder the crew in the performance of their duties, or fail to comply with any instruction of the crew, including but not limited to, those with respect to smoking in any form, drugs, alcohol, or use any threatening, abusive or insulting words towards the crew or behave in a manner which causes discomfort, inconvenience, damage or injury to the crew or other passengers on the flight, we may take such measures as we deem necessary to prevent continuation of such conduct including restraint. You may be disembarked and refused onward carriage at any point and may be prosecuted for offenses committed on board the aircraft. Further, in Wholesale Jet Club’s discretion, your Wholesale Jet Club membership privileges may be revoked permanently, without refund. You agree to reimburse Wholesale Jet Club for any and all reasonable costs and expenses incurred as a result of damage to the aircraft interior and or exterior which is caused by carelessness or neglect by you or any of your guests. Wholesale Jet Club may debit all flight expenses and other charges incurred by you, including costs of damage to aircraft caused by you or your guests. It is the sole responsibility of the Operator to maintain liability insurance coverage. Wholesale Jet Club is not liable for any claims arising in connection with the services of the Operator. Wholesale Jet Club respects copyright law and expects its users to do the same. It is Wholesale Jet Club’s policy to terminate in appropriate circumstances Users or other account holders who repeatedly infringe or are believed to be repeatedly infringing the rights of copyright holders. Any fees that Wholesale Jet Club may charge you for the Service, are due immediately and are non-refundable. This no refund policy shall apply at all times regardless of your decision to terminate your usage, our decision to terminate your usage, disruption caused to our Application or Service either planned, accidental or intentional, or any reason whatsoever. Wholesale Jet Club reserves the right to determine final prevailing pricing. Wholesale Jet Club, at its sole discretion, may make promotional offers with different features and different rates to any of our customers. These promotional offers, unless made to you, shall have no bearing whatsoever on your offer or contract. Wholesale Jet Club may change the fees for our Service or Application, as we deem necessary for our business. We encourage you to check back at our website periodically if you are interested about how we charge for the Service of Application. By entering into this Agreement and using the Service, you agree that you shall defend, indemnify and hold Wholesale Jet Club, its licensors and each such party’s parent organizations, subsidiaries, affiliates, officers, directors, Users, employees, attorneys and agents harmless from and against any and all claims, costs, damages, losses, liabilities and expenses (including attorneys’ fees and costs) arising out of or in connection with: (a) your violation or breach of any term of this Agreement or any applicable law or regulation, whether or not referenced herein; (b) your violation of any rights of any third party, including providers of transportation services arranged via the Service or Application, or (c) your use or misuse of the Application or Service. THE COMPANY MAKES NO REPRESENTATION, WARRANTY, OR GUARANTY AS TO THE RELIABILITY, TIMELINESS, QUALITY, SUITABILITY, AVAILABILITY, ACCURACY OR COMPLETENESS OF THE SERVICE OR APPLICATION. THE COMPANY DOES NOT REPRESENT OR WARRANT THAT (A) THE USE OF THE SERVICE WILL BE SECURE, TIMELY, UNINTERRUPTED OR ERROR-FREE OR OPERATE IN COMBINATION WITH ANY OTHER HARDWARE, APPLICATION, SYSTEM OR DATA, (B) THE SERVICE WILL MEET YOUR REQUIREMENTS OR EXPECTATIONS, (C) ANY STORED DATA WILL BE ACCURATE OR RELIABLE, (D) THE QUALITY OF ANY PRODUCTS, SERVICES, INFORMATION, OR OTHER MATERIAL PURCHASED OR OBTAINED BY YOU THROUGH THE SERVICE WILL MEET YOUR REQUIREMENTS OR EXPECTATIONS, (E) ERRORS OR DEFECTS IN THE SERVICE OR APPLICATION WILL BE CORRECTED, OR (F) THE SERVICE OR THE SERVER(S) THAT MAKE THE SERVICE AVAILABLE ARE FREE OF VIRUSES OR OTHER HARMFUL COMPONENTS. THE SERVICE AND APPLICATION IS PROVIDED TO YOU STRICTLY ON AN “AS IS” BASIS. ALL CONDITIONS, REPRESENTATIONS AND WARRANTIES, WHETHER EXPRESS, IMPLIED, STATUTORY OR OTHERWISE, INCLUDING, WITHOUT LIMITATION, ANY IMPLIED WARRANTY OF MERCHANTABILITY, FITNESS FOR A PARTICULAR PURPOSE, OR NON-INFRINGEMENT OF THIRD PARTY RIGHTS, ARE HEREBY DISCLAIMED TO THE MAXIMUM EXTENT PERMITTED BY APPLICABLE LAW BY THE COMPANY. THE COMPANY MAKES NO REPRESENTATION, WARRANTY, OR GUARANTY AS TO THE RELIABILITY, SAFETY, TIMELINESS, QUALITY, SUITABILITY OR AVAILABILITY OF ANY SERVICES, PRODUCTS OR GOODS OBTAINED BY THIRD PARTIES THROUGH THE USE OF THE SERVICE. YOU ACKNOWLEDGE AND AGREE THAT THE ENTIRE RISK ARISING OUT OF YOUR USE OF THE APPLICATION AND SERVICE, AND ANY THIRD PARTY SERVICES OR PRODUCTS REMAINS SOLELY WITH YOU, TO THE MAXIMUM EXTENT PERMITTED BY LAW. IN NO EVENT SHALL THE COMPANY’S AGGREGATE LIABILITY EXCEED THE AMOUNTS ACTUALLY PAID BY AND/OR DUE FROM YOU IN THE SIX (6) MONTH PERIOD IMMEDIATELY PRECEDING THE EVENT GIVING RISE TO SUCH CLAIM. IN NO EVENT SHALL THE COMPANY AND/OR ITS LICENSORS BE LIABLE TO ANYONE FOR ANY INDIRECT, PUNITIVE, SPECIAL, EXEMPLARY, INCIDENTAL, CONSEQUENTIAL OR OTHER DAMAGES OF ANY TYPE OR KIND (INCLUDING PERSONAL INJURY, LOSS OF DATA, REVENUE, PROFITS, USE OR OTHER ECONOMIC ADVANTAGE). THE COMPANY AND/OR ITS LICENSORS SHALL NOT BE LIABLE FOR ANY LOSS, DAMAGE OR INJURY WHICH MAY BE INCURRED BY YOU, INCLUDING BY NOT LIMITED TO LOSS, DAMAGE OR INJURY ARISING OUT OF, OR IN ANY WAY CONNECTED WITH THE SERVICE OR APPLICATION, INCLUDING BUT NOT LIMITED TO THE USE OR INABILITY TO USE THE SERVICE, ANY RELIANCE PLACED BY YOU ON THE COMPLETENESS, ACCURACY OR EXISTENCE OF ANY ADVERTISING, OR AS A RESULT OF ANY RELATIONSHIP OR TRANSACTION BETWEEN YOU AND ANY THIRD PARTY SERVICE PROVIDER, ADVERTISER OR SPONSOR WHOSE ADVERTISING APPEARS ON THE WEBSITE OR IS REFERRED BY THE SERVICE, EVEN IF THE COMPANY AND/OR ITS LICENSORS HAVE BEEN PREVIOUSLY ADVISED OF THE POSSIBILITY OF SUCH DAMAGES. THE QUALITY OF THE AIR CHARTER SERVICES SCHEDULED THROUGH THE USE OF THE SERVICE OR APPLICATION IS ENTIRELY THE RESPONSIBILITY OF THE THIRD PARTY PROVIDER WHO ULTIMATELY PROVIDES SUCH TRANSPORTATION SERVICES TO YOU. YOU UNDERSTAND, THEREFORE, THAT BY USING THE APPLICATION AND THE SERVICE, YOU MAY BE EXPOSED TO AIR CHARTER SERVICES THAT ARE POTENTIALLY DANGEROUS, OFFENSIVE, HARMFUL TO MINORS, UNSAFE OR OTHERWISE OBJECTIONABLE, AND THAT YOU USE THE APPLICATION AND THE SERVICE AT YOUR OWN RISK. Wholesale Jet Club may give notice by means of a general notice on the Service, electronic mail to your email address on record in the Wholesale Jet Club’s account information, or by written communication sent by first class mail or pre-paid post to your address on record in the Wholesale Jet Club’s account information. Such notice shall be deemed to have been given upon the expiration of 48 hours after mailing or posting (if sent by first class mail or pre-paid post) or 12 hours after sending (if sent by email). You may give notice to Wholesale Jet Club (such notice shall be deemed given when received by Wholesale Jet Club) at any time by any of the following: letter delivered by nationally recognized overnight delivery service or first class postage prepaid mail to Wholesale Jet Club at the following addresses: Wholesale Jet Club, Inc., 244 5th Avenue., S240, New York, NY 10001 addressed to the attention of: CEO. This Agreement may not be assigned by you without the prior written approval of Wholesale Jet Club but may be assigned without your consent by Wholesale Jet Club to (i) a parent or subsidiary, (ii) an acquirer of assets, or (iii) a successor by merger. Any purported assignment in violation of this section shall be void. Any claim or dispute arising out of or relating to this Agreement or the breach, termination, enforcement, interpretation or validity thereof or the use of the Service or Application (collectively, “Disputes”) between the Parties and/or against any agent, employee, successor, or assign of the other, whether related to this agreement or the relationship or duties contemplated herein, including the validity of this clause, shall be resolved by binding arbitration by the American Arbitration Association, under the Commercial Arbitration Rules and the Supplementary Procedures for Consumer Related Disputes then in effect, by a sole arbitrator. Except that each party retains the right to bring an individual action in small claims court and the right to seek injunctive or other equitable relief in a court of competent jurisdiction to prevent the actual or threatened infringement, misappropriation or violation of a party’s copyrights, trademarks, trade secrets, patents or other intellectual property rights. The existence and content of the arbitration proceedings and any rulings or award shall be kept confidential except (i) to the extent that disclosure may be required of a party to fulfill a legal duty, protect or pursue a legal right, or enforce or challenge an award in bona fide legal proceedings before a state court or other judicial authority, or (ii) with the written consent of all parties. Notwithstanding anything to the contrary, either party may disclose matters relating to the arbitration or the arbitration proceedings where necessary for the preparation or presentation of a claim or defense in such arbitration. You acknowledge and agree that you and Wholesale Jet Club are each waiving the right to a trial by jury or to participate as a plaintiff or class User in any purported class action or representative proceeding. Further, unless both you and Wholesale Jet Club otherwise agree in writing, the arbitrator may not consolidate more than one person’s claims, and may not otherwise preside over any form of any class or representative proceeding. If this specific paragraph is held unenforceable, then the entirety of this “Dispute Resolution” section will be deemed void. Except as provided in the preceding sentence, this “Dispute Resolution” section will survive any termination of this Agreement. The place of arbitration shall be Kings County, NY. Except for those agency relationships specifically referenced in the Wholesale Jet Club Membership and Flight Booking Terms and Conditions, no joint venture, partnership, employment, or agency relationship exists between you, Wholesale Jet Club or any third party provider as a result of this Agreement or use of the Service or Application. If any provision of the Agreement is held to be invalid or unenforceable, such provision shall be struck and the remaining provisions shall be enforced to the fullest extent under law. The failure of Wholesale Jet Club to enforce any right or provision in this Agreement shall not constitute a waiver of such right or provision unless acknowledged and agreed to by Wholesale Jet Club in writing. This Agreement comprises the entire agreement between you and Wholesale Jet Club and supersedes all prior or contemporaneous negotiations, discussions or agreements, whether written or oral, between the parties regarding the subject matter contained herein. 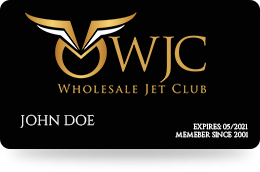 By subscribing to Wholesale jet members Inc.’s dba Wholesale Jet Club (“WJC”) membership you (“Member”) and Wholesale jet club agree to the following terms and conditions (this “Agreement”) relating to the services provided in relation to Member’s subscription to WJC’s membership program. Wholesale jet club may amend or modify this Agreement from time to time. Amendments and modifications to this Agreement will be effective upon WholeSale Jet Club’s publication of such amendments or modifications on its website. Member’s continued access or use of the Service after such posting constitutes Member’s consent to be bound by the amended or modified Agreement. Wholesale jet club and Member are sometimes referred to herein collectively as “parties” and each a “party”. As one of the benefits of the membership program, Wholesale Jet Club, as Member’s agent, agrees to arrange air transportation services for Member to be provided by aircraft operators holding an air carrier certificate authorizing them to furnish air transportation services pursuant to Federal Aviation Regulations 14 C.F.R. Part 135 (“FAR Part 135″) (the “Program”). Member understands that Wholesale jet club is not an aircraft operator and arranges private jet charter services solely as a manager of the Program and as Member’s agent. For clarification purposes, “Private Jet Charter”, “Aircraft Charter”, “Private Charter”, and “Charter”, refers to using, booking, arranging or chartering an aircraft. Except when it is expressly stated that a flight is operated pursuant to the Public Charter Program, all travel arrangements are made on-demand according to customer-directed itineraries and flight requirements under the terms and conditions, restrictions and limitations reflected herein. Wholesale jet club may provide access to its software including websites, electronic social/commerce, marketplaces, and integrated communication tools, which form part of the Program, and are designed to enhance the user-experience, communications, service optimization, functionality and logistics of the Program (“Software”). Members can access and utilize such Program and Software only as stipulated and limited under the terms and conditions of this Agreement. In exchange for a membership fee, Wholesale jet members Inc. provides access to numerous services and benefits that include, but are not limited to, concierge service that can assist with various types of reservations, including hotel, restaurant, nightlife entertainment, yachts and cars; customer service of membership specialist; invitation to Wholesale jet members organized events; sourcing aircraft for the purpose of Aircraft Charter; acting as Member’s agent in negotiating wholesale pricing with operators and signing charter contracts on Member’s behalf; organizing aircraft reservation; coordinating payment; arranging in-flight services; flight tracking; and services as a charterer in organizing public charter flights (collectively, the “Services”). The specific Services a Member will have access to (and any limits on such Services) is based on the tier of membership that a Member purchases. Grandfathered membership fee rates are subject to periodic inflation adjustments and do not include access to new services or benefits that may be offered after the initial date of purchase of membership. All flights under this Agreement are operated by a FAR Part 135 air carrier (the ”Operator”), who shall have exclusive direction, control and authority over initiating, conducting or terminating flights (“Operational Control”). Wholesale Jet Club is not a FAR Part 135 air carrier and does not provide air carrier services. The Operator performing the flight will be subject to, among other things, flight time and duty time restrictions, and airport limitations that may preclude or limit operations to certain airports and other applicable regulations and requirements. Member understands and agrees that the Operator shall have absolute discretion in all matters, including, without limitation, the preparation of the aircraft for flight and the flight itself, the load carried and its distribution, the decision whether or not a flight will be performed, what route will be flown, and all matters relating to the operation of the aircraft. Member specifically agrees that the Operator shall have final and complete authority to cancel any flight for any reason or condition that in its sole and absolute judgment could compromise the safety of a flight and may take any other action that, in its opinion, is necessitated in consideration of safety. No such action of the Operator shall create or support any liability for loss, injury, damage or delay to Member. In addition, the Operator shall have the right to refuse boarding to any person: (a) who appears to be intoxicated or under the influence of any illicit or controlled substance drug; (b) who refuses to be subject to any reasonable checks of his or her person or baggage by the Operator, or by government or airport authorities; (c) whose condition, including apparent illness or incapacity, in the sole judgment of the Operator could involve hazard or risk to himself, herself or others; or (d) who fails to provide proper identification. Member agrees to provide all information requested by Wholesale jet members through the website and forms provided online, via email or mail in accordance with Wholesale jet members policies and procedures. Acceptance of Members into the Membership Program and renewal of Member’s Membership for an additional term is at the sole discretion of WJC. If upon application, Member is refused admission to the Membership Program, Wholesale jet members will refund the Membership Fee, if any was charged, and there shall be no further obligation owed by either party. Wholesale jet members reserves the right to revoke Member’s admission to the Membership Program at its sole discretion at any time during Member’s Membership term by refunding prorated Member’s Membership. Member understands and agrees that he or she is obligated to pay membership fee in exchange for access to the Membership Services, Member agrees to pay a quarterly, semi-annual or annual membership fee during the entire Term (defined below) of this Agreement (the “Membership Fee”). The Membership Fee includes all applicable taxes. The Membership Fee is due on a quarterly, semi-annual or annual recurring basis. Wholesale jet members reserves the right to increase the Membership Fee from time to time, which increases will apply to existing Members upon renewal of Membership for subsequent Terms unless expressly agreed otherwise by WJC. Member agrees to provide Wholesale jet members a credit card and authorizes Wholesale jet members to automatically charge the Membership Fee to the credit card on file. Members shall provide new or updated credit card information promptly following expiration of the credit card on file. The Membership Fee is an access fee for use of the Service, is not a payment for air transportation, and is non-refundable, except as specifically provided herein, even if Member fails to utilize the Program or the Services. The Membership Fee is not amortized over time and not based on Member’s ability to purchase or use the Service. Unless otherwise specified on the Membership Invoice or terms of a valid promotional membership offer, the Membership term is for a period of, three (3), six (6) or twelve (12) months (the “Terms”), commencing on the day the and the Membership Fee are paid in full (the “Effective Date”). Wholesale jet members reserves the right to terminate and cancel Member’s Membership at any time if Member breaches any terms or conditions of this Agreement or other agreements incorporated herein by reference. Member understands and agrees that if the Membership is cancelled due to Member’s breach of any terms or conditions of this Agreement or other agreements incorporated herein by reference, Member will lose all privileges. Wholesale jet members will not owe any further obligation to provide any Services, credits or benefits to Member. Member agrees that he or she will not be entitled to a refund of the Membership Fee, or any portion of it and will hold Wholesale jet members harmless for the loss of the Service, credits or any additional benefits. The Membership Term will be conveniently renewed automatically and you agree to be charged for the subsequent Membership Term unless you provide Wholesale jet members a written notice not to renew at least thirty (30) days prior to the expiration of any preceding Term. If Member’s credit card is declined, Member agrees to provide a different method of payment within three (3) business days. If Member fails to provide a different method of payment, and the Membership Fee is due and outstanding longer than ten (10) business days, the Member’s Membership will be cancelled. Any outstanding charges shall remain due until paid in full. At its sole discretion, Wholesale jet member may offer certain Members trial or other promotional memberships with different features, which are subject to the terms of this Agreement, except as otherwise stated in the promotional offer. Promotional Membership is valid only for the period specified in the promotional offer. If no period is specified, Wholesale jet members may terminate promotional Memberships at any time in its sole discretion. Wholesale jet members takes appropriate measures to maintain data regarding its Members and their guests confidential. Wholesale jet members may be required to furnish Member data, such as name, date of birth, and passport information, to comply with national and international security requirements or rules of governing bodies. It may also be necessary for Wholesale jet members to provide names of persons on a flight and other information to third parties providing services related to a flight including to the operator and governmental authorities. Wholesale jet members may use Member information to check the credit of Member in connection with its invoice collection efforts or to check the credit of Member and perform criminal and other background searches of Member in connection with evaluating whether to accept Member to the Membership Program. Wholesale jet members does not sell Member data to third parties. This Agreement and all the rights of the parties shall be construed and enforced in accordance with the laws of the State of New York without reference to the conflict of law principles of any jurisdiction. Any claim or dispute between the parties and/or against any agent, employee, successor, or assign of the other, whether related to this Agreement, any of the Terms and Conditions or the relationship or rights or obligations contemplated herein, including the validity of this clause, shall be resolved by binding arbitration by the American Arbitration Association, under the Commercial Arbitration Rules and the Supplementary Procedures for Consumer Related Disputes then in effect, by a sole arbitrator. The place of arbitration shall be Kings County, New York. The existence and content of the arbitration proceedings and any rulings or award shall be kept confidential except (i) to the extent that disclosure may be required of a party to fulfill a legal duty, protect or pursue a legal right, or enforce or challenge an award in bona fide legal proceedings before a state court or other judicial authority, or (ii) with the written consent of all parties. Notwithstanding anything to the contrary, either party may disclose matters relating to the arbitration or the arbitration proceedings where necessary for the preparation or presentation of a claim or defense in such arbitration. Arbitration shall proceed solely on an individual basis without the right for any claims to be arbitrated on a class action basis or on bases involving claims brought in a purported representative capacity on behalf of others. The arbitrator's authority to resolve and make written awards is limited to claims between Member and Wholesale jet members alone. Claims may not be joined or consolidated unless agreed to in writing by all parties. No arbitration award or decision will have any preclusive effect as to issues or claims in any dispute with anyone who is not a named party to the arbitration. Notwithstanding any other provision in these terms and conditions and without waiving either party's right of appeal, if any portion of this “class action waiver and other restrictions” provision is deemed invalid or unenforceable, then the remaining portions of the arbitration provision shall remain in full force and effect. This Agreement shall be binding upon and inure to the benefit of the parties. Member may not assign or transfer his or her rights or obligations without the prior written consent of Wholesale Jet Club, which may be withheld at its sole discretion. If any provision of this Agreement is declared by an arbitrator or a court of competent jurisdiction to be invalid, illegal, or unenforceable, such provision shall be limited or eliminated to the minimum extent necessary so that this Agreement shall otherwise remain in full force and effect. Wholesale jet members may give notice by means of a general notice through the Software, electronic mail to Member’s email address on record or by written communication sent to Member’s address on record. Such notice shall be deemed to have been given upon the expiration of forty eight (48) hours after mailing (if sent by first class mail) or twelve (12) hours after posting or sending it via email or other means of electronic transmission. Member may give notice to Wholesale jet members(such notice shall be deemed given when received by WJC) at any time by any of the following: letter sent by confirmed facsimile to Wholesale jet member sat the following fax number: +1 (347) 416-6996; letter delivered by nationally recognized overnight delivery service or first class postage prepaid mail to Wholesale jet members at the following address: Wholesale jet members Inc., 244 5th Avenue Suite S240., New York, NY 10001 addressed to the attention of: Chief Executive Officer, with a copy to the Legal Department. This Agreement together with the agreements and other documents referenced herein and incorporated herein by reference constitute the entire agreement between the parties concerning its subject matter and supersedes any prior or contemporaneous agreements, understandings or proposals. Paragraph headings are for convenience of reference only and shall not affect or be utilized in construing or interpreting this Agreement. No provision of, right, power or privilege under this Agreement shall be deemed to have been waived by any act, delay, omission or acquiescence on the part of any party, its agents or employees, but only by an instrument in writing signed by an authorized representative of each party. This Agreement shall not be construed as creating a joint venture, partnership or other form of association or cooperative arrangement between Wholesale jet members and Member. No waiver by any party of any breach or default of any provision of this Agreement by the other party shall be effective as to any other breach or default. Each party agrees that the electronic signatures and acknowledgments, whether digital or encrypted, of the parties to this Agreement are intended to authenticate this writing and to have the same force and effect as manual signatures. Electronic signature means any electronic sound, symbol or process attached to or logically associated with a record and executed and adopted by a party with the intent to sign such record, including facsimile or e-mail electronic signatures. Member’s access or use of the Service and the Application constitutes Member’s agreement to be bound by all terms and provisions of this Agreement (including the agreements and other documents referenced herein and incorporated herein by reference) as amended or modified from time to time. *By clicking Subscribe you are agreeing to the Terms and Conditions & Membership Agreement listed above.